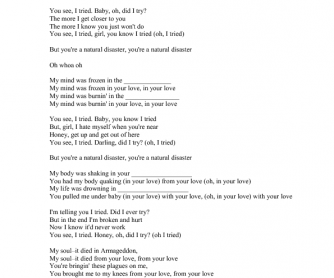 This song is perfect for practising the topic of natural disasters (ex. in Solutions Pre-Intermediate or English File Pre-Intermediate), because it contains a lot of key lexis, such as wild fire, tornado, earthquake, blizzard, tsunami, etc. It's a gap-fill activity.